I don't do much in the way of advertising my books - but it's fun making gifs! I sit in two worlds on Goodreads. I came to the site as a reader, though I used it primarily for looking up information about books. When I self-published, I had my account converted to an author account, ran a few giveaways, and slowly developed a taste for tracking which books I've read. I joined some groups, though I'm only an occasional poster. I continue to run giveaways, and occasionally my readers will find me there and friend or follow me, but primarily I use the site as a reader, following the feed of other readers whose reviews entertain me, or who analyse books on points I'm interested in, such as treatment of women. Just this past week I've particularly felt the "feet in both camps" nature of being both a reader and writer as a site ironically named GRBullies started receiving attention. This site collects the personal information of various readers who use Goodreads (addresses, photographs) in, it claims, an attempt to name and shame bullies who harass authors on Goodreads. This site greatly resembles (and also alludes to) an earlier incident where an author had posted a similar collection of information on her blog about a reader (Google "Selection Debacle" for further information). The end result of that incident was the reader – someone who had posted a very measured, balanced review (of a book which wasn't even the attacking author's book) – stopped using Goodreads for some time. Links to the GRBullies site have been appearing on various writer forums I read, often followed by a mix of comments from people who have no problem with Goodreads, and people who call it a cess pit. I've also been watching the discussion direct on Goodreads, because the people named on GRBullies…? Most of them are readers whose reviews I've been following for the past year or so. *- There is an emphasis that the site is for readers to track their books and discuss them. There are opportunities as an author to promote, but they are within strict boundaries to prevent promotion from becoming intrusive. There is a clear message to me that this is reader territory, not author territory. *- I'm not actively notified of new ratings and reviews, though if I want to read them I can track them down via an author dashboard which shows me total numbers. *- I have a little over 700 ratings (nearly 200 of which include text commentary), which range from 1 star to 5 star. *- No-one has called me names. Not everyone has liked my books. Some have said what didn't work for them in a blunt or snarktastic manner. Not everyone is polite, or coats their opinion of my writing in syrup, but I have never felt even remotely bullied. *- The Goodreads administration discourages authors from commenting on their own reviews – a pop-up message appears warning you off when you start, though it still permits you to comment. Occasionally there have been incidents which I have watched from the sidelines. The majority of these have involved comments appearing on a review which amounted to "your opinion, you have it wrong". This is where "territory" is triggered. Everyone's perception of a book is different. There are many popular books which one person will love and another will think is dull or boring or sexist. The review is their own personal opinion of a book, their 'mental territory'. Comments on reviews, even comments which disagree with the review, aren't automatically treated as bad. A comment phrased as "I didn't react to that character's treatment in that way, and so ended up liking the book a great deal more than you did. Do you think the author was trying to deliberately comment on prejudice there?" is a relatively neutral engagement in a conversation while "You're reading it wrong; are you blind?" will be received as an attack, not an engagement to discussion. Many comments like the latter result in other readers defending the reviewer's right to have their own reaction to the book, even if it doesn't conform to the commenter's. Sometimes the exchanges escalate and (given that Goodreads has such an enormous number of users) sometimes matters will descend to name-calling. Some name-calling comes from inexperienced users, who are often corrected by community members. Sometimes the name-calling stands and matters escalate further. Usually the dissenting commenter is repeatedly told to go write their own review rather than argue with the first reader's opinion in the first reader's 'territory'. Who is the bully here? The person insisting someone's personal reaction to a book is wrong, or various connected readers quick to defend the territory of reader opinions? *- Goodreads is a place for readers to express their opinions about books. *- Not everyone will have the same opinion, even about my favourite books in the whole world. *- If I respect other people's opinions, they will generally accord me the same courtesy. There are more than a million people using Goodreads. They all have their own views on how polite they need to be when expressing their opinions. I may occasionally be a little blunt expressing my own. But one thing I always manage to remember is that my opinion is only absolutely correct to me – and people are not bullies for insisting they be allowed to have their own. 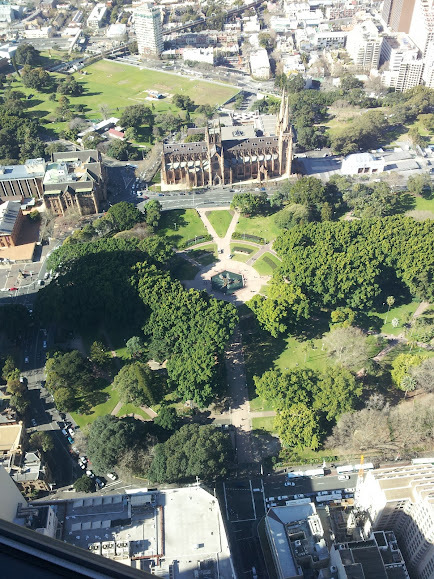 A photo of the Sydney Spire site (taken from the vantage point of the third major setting in the book). It amuses me greatly that I will be able to claim lunchtime sightseeing trips on my taxes.